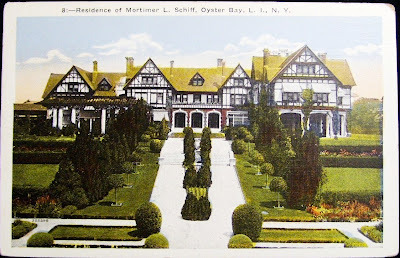 'Northwood', the Mortimer L. Schiff estate designed by C.P.H. 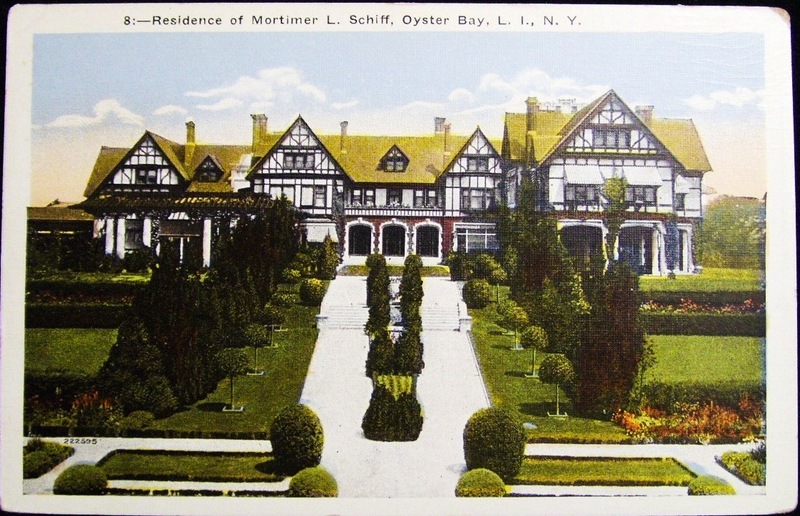 Gilbert c. 1905 in Oyster Bay. Click HERE and HERE for more on 'Northwood'. The residence is no longer standing. Someone else who managed to get himself planted in St John's Memorial Cemetery in Cold Spring Harbor. Hmmm, I got here first. I'd better just stay quiet. LOL..........Silence is golden or so they say. I do like this style of home so I like this CPH design (it lends itself well visually to the enormous square footage required by Mortimer Schiff and the enlarged home even looks liveable, if that is possible to imagine) The gardens were also quite extensive and impressive. Would love to see more of the interiors one day. In this particular case I believe the Schiff grandchildren have actually converted. And FWIW...St. John's is, in my humble opinion, the most impressive cemetery on the North Shore. Whenever I go I've almost never run into anyone else...it's like walking through a botanical garden in total peace and silence and the place feels like it just goes on and on. It's kind of a macabre form of Where's Waldo...you never know which familiar name you're going to stumble upon next. It took me a half hour to find Otto Kahn...who has a very impressive section for his family. I haven't come across Morti Schiff though...I'll put him on the list. Here's Kahn's plot... it would have been a better photograph had I had a 10 foot ladder to stand on. Don't forget Locust Valley Cemetery on Ryefield Road. Both places are more arboretum like than actual burial grounds. Both are spectacular in the Spring. One Mortimer Schiff married a Baker- Florence or Dolly, can't remenber which. This house burned down during their occupancy, so they build the house that stands today, in it's place. You have your history mixed up. Morti Schiff was married to Adele G. Neustadt. His son John married Edith Brevoort Baker. But the house did not burn down, it was torn down in the '40s and replaced by John. Sorry- shouldn't have been so offhand about my comment- John and Edith- yes, yes. A relative of Edith's told me that the original house burned down and that they rebuild something smaller in the French Norman style because they loved the gardens, so that's where I came up with that. Basic question: When houses like this were torn down, were elements saved/salvaged? Or was everything just hauled off to a landfill? I wonder about all that mahogany and marble. Along with such a grand and lovely estate, The Schiff's were known to be very generous to their loyal staff. One of my brothers married the daughter of one of the caretakers - she grew up on the estate and has fond memories, including having her own horse boarded in those lovely stables. Putting aside that they were "the help", can you imagine how much fun it would be to come of age in those surroundings? Her father retired after spending his entire adult life working for the Schiff's and was fortunate to have excellent benefits and an actual retirement plan - they really took care of their people, which I personally loved to hear. One look at the grounds speaks volumes to their skill and dedication. Patricia it is probably a fairly good assumption that when homes like this were torn down, circa 1940's and especially pre-WW II a lot was discarded or sold off for scrap. Historic paneling and marble mantles may have been rescued, but finished interior elements would have been undesirable and/or out of fashion with little resale market value. There were photos published somewhere once that showed a major 5th Ave home during demolition. The top of the sidewalk shed surrounding the exterior was lined with the discarded panelled wood doors all nailed haphazardly together and the stone balustrade of the interior staircase was being hacked to pieces. I heard somewhere that the original roofing tiles were used on the new house. Also, the now outdoor pool was originally an indoor pool in the old house (shrinking footprint).